My mother-in-law, Pam, bought me for Christmas some Delon body butter from Costco a few years back. Thinking it was greasy like all the rest I didn’t rush to use it. Mistake. Once I cracked open the jar I was immediately hooked. It is – hands-down – the best body butter I’ve ever used. My favorite scent is the coconut. Every time I put some on I get a ton of compliments about smelling like summer. The pomegranate are mango are close seconds. I haven’t tried many others, but I’d venture to say they are equally as fantastic. The Web site is very under-assuming. By looking at it, you’d think it was a fly-by-night company or shoddy product. Don’t be fooled. Everything the site says is 100 percent true. 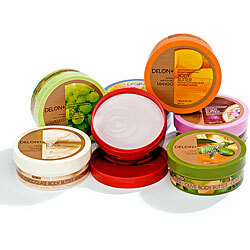 “Delon body butter is the name of the best body butter available today, and it is creating a big impression. A lot of folks haven’t heard a lot about it up until recently, but it is quickly growing in reputation as one of the better body butters available today. If you are fortunate enough to have tried the delon body butter range then you will know that it is a great scented moisturizer, which indulges all of your senses as well as softening your pores and skin. Delon body butter is a rapidly absorbed and a non-greasy body butter, which leaves the skin totally soft and smooth. It lasts a very long time and you do not need to use a great deal to get the desired effect. These days Pam doesn’t even ask if I want any more body butter for Christmas or birthdays, she just automatically gets it for me. It is great. It is no longer sold at Costco, so you have to go online to get it through Amazon or Overstock.com. But it is well worth it. Happy moisturizing.